After the surprise release of his new album Kamikaze, Eminem has dropped the video for first single, Fall. 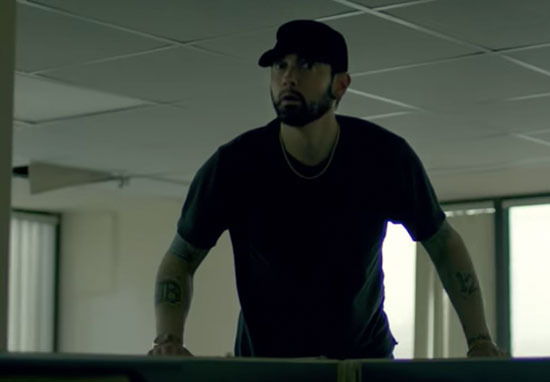 With many people calling the new album a return to form for the rapper, the video is a self-aware piece, featuring Slim acknowledging the criticism he attracted online for his last album, 2017’s Revival. After footage of Eminem scrolling through endless tweets and social media messages on his phone, such as ‘Revival is dead on arrival’ and ‘Will the old Slim Shady please come back?’, the rapper gets out the car, drops his phone on the ground and seems to go on a night time journey of self-(re)discovery. As a sinister being emerges from his phone and proceeds to haunt Slim, the rapper does everything he can to escape. And although the message in the video for Fall isn’t exactly overthought – he literally falls over a lot, social media=bad etc. The track and video together show a newfound acceptance of the past and a refreshing step forward for Marshall Mathers. The step forward also includes crushing a CD of his last album Revival. However, the track isn’t without its fair share of controversy. As is becoming more and more common these days, Eminem uses the track to diss other rappers. Most notably, in this track, the 45-year-old takes aim at Tyler, the Creator. Tyler create nothin’, I see why you called yourself a f****t, b*tch, It’s not just ‘cause you lack attention, it’s ‘cause you worship D12’s balls, you’re sacrilegious. The line has sparked outrage online due to its homophobic language, with a number of prominent figures and other musicians criticising Slim for the line. The new track also features vocals by Bon Iver’s Justin Vernon. Since the surprise release of the track, however, Vernon has distanced himself from it, disagreeing with its message and lyrical content. While Eminem has never shied away from using his music to call out other rappers, it seems his choice of language this time has drawn more criticism than usual. Despite this, the rapper is still on track to break a 36-year-old UK chart record, with what looks to be his ninth consecutive number one album.